We offer the full range of Celtic Birthstone Necklaces/Pendants with Personalised Gift Boxes. Sterling silver pendants (.925) each with a 16" curb chain (different from the one pictured). One necklace for each month of the year. 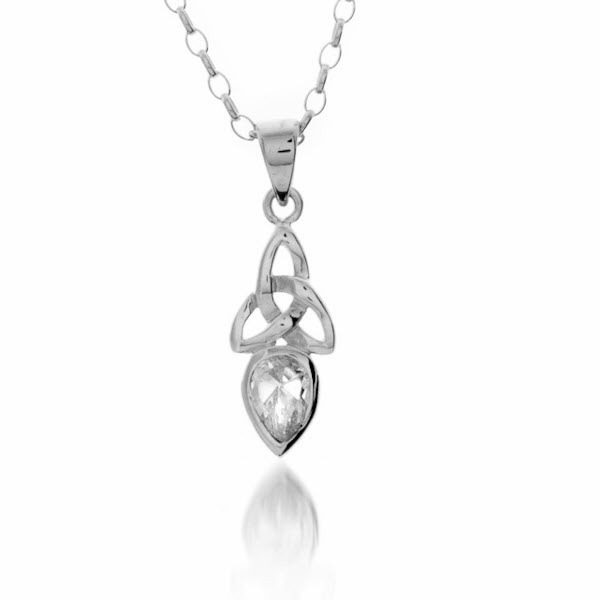 Celtic Trinity Knot pendant with the birthstone of April - Diamond (Cubic Zirconia): Meaning Purity and Innocence. The gift boxes each come with an engraved plaque with your personalised message. They make perfect Birthday presents but also ideal for Christmas, Anniversaries, Christening keepsakes.....it's endless!